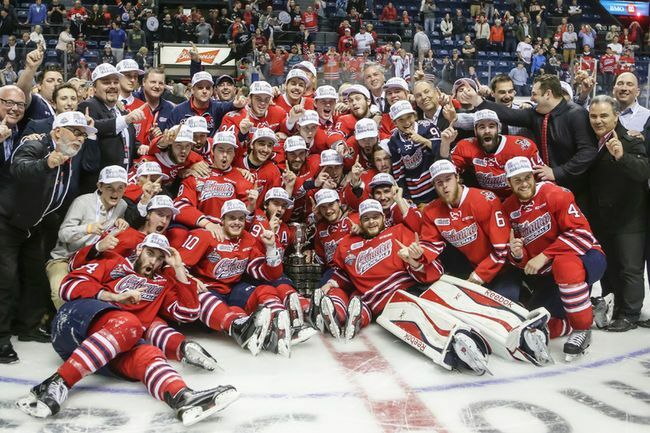 Where are the players from the 2015 Memorial Cup winning Oshawa Generals now? Brad Latour: Saint Mary’s University (CIS). 16 GP, 7 G, 2 A, 9 P, 14 PIM. Cole Cassels: Utica Comets (AHL). 12 GP, 2 G, 0 A, 2 P, -1, 14 PIM. Hunter Smith: Stockton Heat (AHL). 10 GP, 0 G, 2 A, 2 P, 0 +/-, 7 PIM. Brent Pedersen: Laurentian University (CIS). 16 GP, 3 G, 7 A, 10 P, 4 PIM. Michael McCarron: St John’s IceCaps (AHL). 20 GP, 3 G, 8 A, 11 P, -7, 40 PIM. Tobias Lindberg: Toronto Marlies (AHL). 16 GP, 3 G, 4 A, 7 P, +4, 16 PIM. Michael Dal Colle: Bridgeport Sound Tigers (AHL). 19 GP, 7 G, 2 A, 9 P, 0 +/-, 4 PIM. Anthony Cirelli: Oshawa Generals (OHL). 23 GP, 13 G, 19 A, 32 P, +18, 8 PIM. Matt Mistele: Ryerson Rams (CIS). 8 GP, 3 G, 4 A, 7 P, 8 PIM. Joe Manchurek: Oshawa Generals (OHL). 13 GP, 4 G, 5 A, 9 P, 0 +/-, 7 PIM. Aidan Wallace: University of Toronto (CIS). 15 GP, 6 G, 7 A, 13 P, 24 PIM. Michael Turner: Roanoke Rail Yard Dawgs (SPHL). 12 GP, 3 G, 3 A, 6 P, -7, 9 PIM. Josh Brown: Springfield Thunderbirds (AHL). 15 GP, 2 G, 2 A, 4 P, +2, 21 PIM. Dakota Mermis: Tucson Roadrunners (AHL) 14 GP, 0 G, 2 A, 2 P, -4, 8 PIM. Will Petschenig: Genève-Servette HC (NLA-top tier Swiss hockey league). 26 GP, 0 G, 1 A, 1 P, +1, 10 PIM. Chris Carlisle: Binghampton Senators (AHL) 17 GP, 1 G, 4 A, 5 P, -6, 11 PIM. Stephen Desrocher: Kingston Frontenacs (OHL). 23 GP, 3 G, 7 A, 10 P, -8, 18 PIM. Mitch Vande Sompel: Oshawa Generals (OHL). 24 GP, 10 G, 14 A, 24 P, +13, 27 PIM. Most goals by OHL D-man. Ken Appleby: Adirondack Thunder (ECHL). 4-1-0-0, 1.98 GAA, .915 save %, 1 shutout. Albany Devils (AHL). 3-0-0-0, 2.63 GAA, .932 save %, 0 shutout. Kenny Huether: Oshawa Generals (OHL). 26 GP, 8 G, 6 A, 14 P, +6, 24 PIM. Sam Harding: Kingston Frontenacs (OHL). 25 GP, 4 G, 6 A, 10 P, -9, 10 PIM. Stephen Templeton: Oshawa Generals (OHL). 22 GP, 1 G, 3 A, 4 P, -3, 26 PIM. Sonny Hertzberg: Herning Blue Fox (Denmark). 16 GP, 1 G, 1 A, 2 P, +4, 8 PIM. Daniel Robertson: Oshawa Generals (OHL). 24 GP, 1 G, 4 A, 5 P, +7, 12 PIM. Riley Stillman: Oshawa Generals (OHL). 23 GP, 4 G, 13 A, 17 P, +6, 34 PIM.